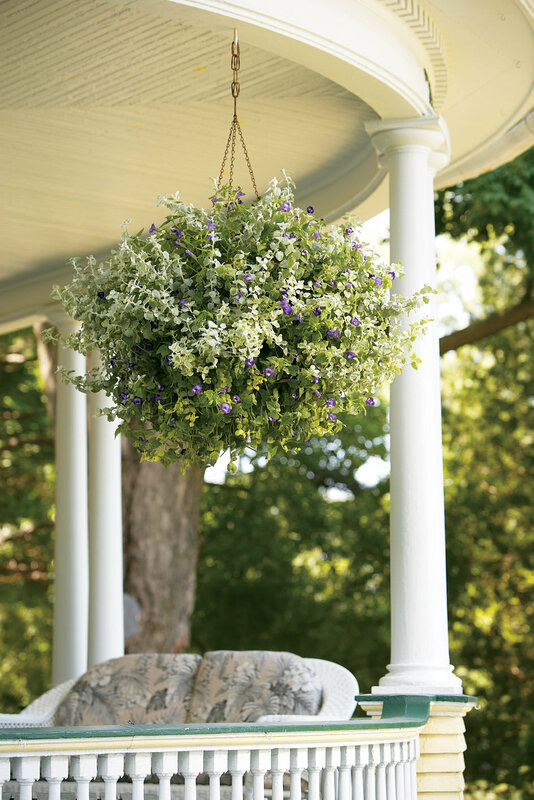 This article is the third in a series of Container Garden Design articles. The first two covered color and structure. 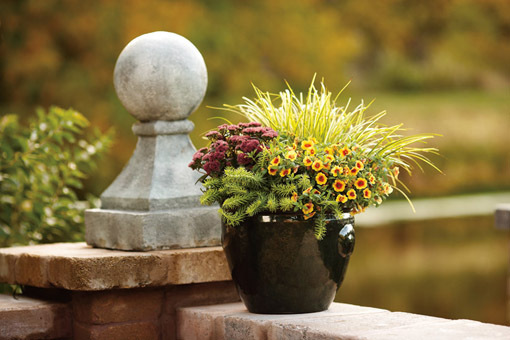 This article will cover using texture in container gardens. 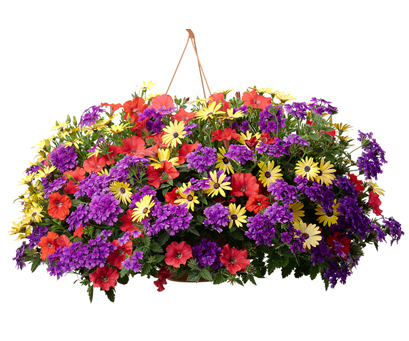 Once you've mastered mixing flower colors and utilizing plants with different habits in your combinations it is time to start considering more advanced concepts. In the beginning when you think of color you think of the flowers. However, foliage color can also add a great color element. In fashion and interior design black, brown, and white are considered neutral colors. 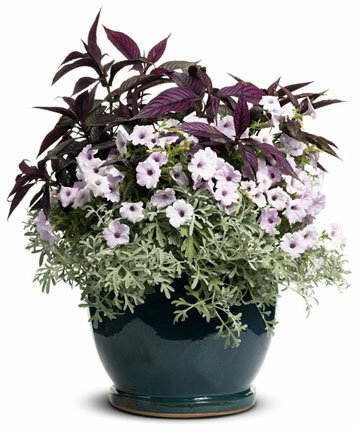 With plants the neutral palate expands to include basic green foliage. In plants, non-basic green foliage functions as color to play with. Silver, black, chartreuse, variegated, and bronze are just some of the different foliage colors that can function as design elements. Consider dark foliage as a way to create both drama and contrast as seen in these combinations, Through The Fire (left) and Misty Morn (right). 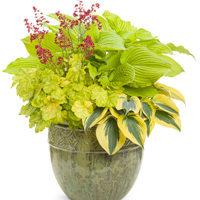 Silver and chartreuse foliage also work as color elements to harmonize with flower color. Silver looks great with pink and other soft colors, blending rather than creating drama or acting as a contrast to dark flowers and foliage, Simple Pleasures (left), and River Dance (right). Chartreuse blends well with hot colors like red ,orange and yellow to create a tropical feel or it can also work as a way to contrast against dark colors, Rhapsody (left). Bronze foliage works great in fall combinations but also helps create combinations with a more natural feel, Cottage Grove (right). Now that you've started to think of foliage as a potential design and color element to contrast or blend with flower color, it is time to add one last element - texture. Texture is defined by dictionary.com as: the characteristic physical structure given to a material, an object, etc., by the size, shape, arrangement, and proportions of its parts. Texture is often thought of as belonging to the foliage in plants, but it also refers to flowers. For plants texture usually refers to the size, shape and surface (leaves can be hairy, smooth, crinkled) of foliage and flowers. Using different sizes and shapes of foliage and flowers can really add a lot to your combination. 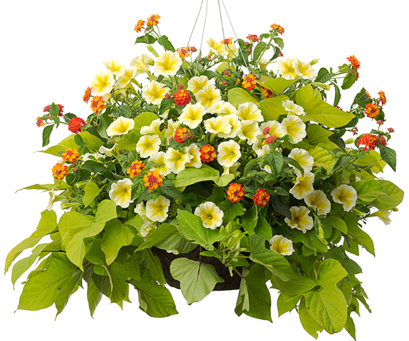 There is nothing wrong with using flowers and foliage of similar sizes and shapes to create your combinations. 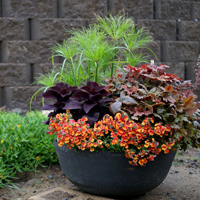 Combinations using plants with similar textures will result in planters where everything blends together. Your eyes will have a tendency to take in the whole combination rather then stopping on any single element, Vacation Days (right), The Gold Rush (middle), and California Blue (right). 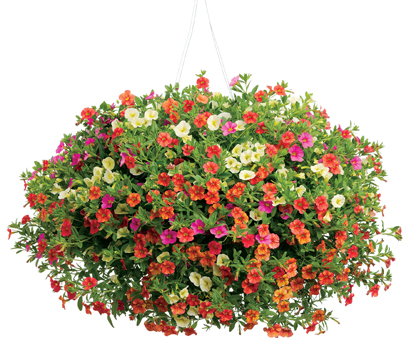 Using plants with different sizes and shapes of flowers and/or foliage will create more contrast. In combinations with a greater range of texture, your eyes will be more likely to focus on each element of the combination as both an individual plant and as an arrangement together, Good Karma (left) and It's All Good (right). Grasses are one of my favorite plants to use in combinations. Their long, linear lines add an element you don't get from many other plants. They play well against the more rounded shapes of most other plants, Classic Vintage. 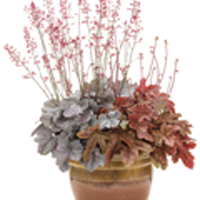 If you really want to learn about the impact of texture in combinations play around with combinations composed of only foliage plants or flowers of a similar color. 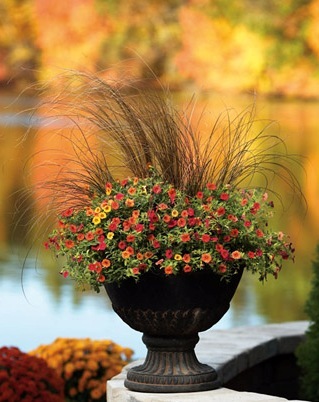 Absolutely stunning combinations can be made with foliage plants by utilizing texture differences.